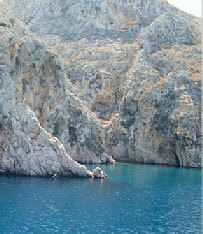 Kalymnos, Kalimnos, Kalemnos, Calymnos, Calimnos, Calemnos, Dodecannese Islands, Greece Hotels Guide & Greek Holidays. The island is now as in ancient times known for the fishing and marketing of sponges. The earliest inhabitants were probably Carians; later -around 1100 B.C.- Kalymnos was colonized by Dorians. In antiquity its fortunes tended to follow those of Kos and later it underwent the usual Byzantine, Venetian, Rodian, Turkish and Italian periods. In 1947 it reverted to Greece. Kalymnos town with 9400 inhabitants is the capital of the island and was founded in 1850. the church of Ag. Hristos is the most beautiful Neobyzantine church of the town. To the west is a hill with ruined Castle of the Knights. Horio is the former capital of the island, built below the castle (9th century), which served as an refuge in Middle Ages. Kefalas, the cave, which can be reached by boat only, was a sanctuary of Olympian Zeus. Telendos is the island close to the western shore with the ruins of the monastery of Agia Vassileos dominated by a medieval castle. Vathis is a small village at the east coast with a fjord like inlet..